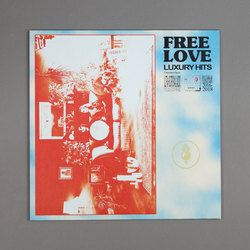 Free Love - Luxury Hits. Vinyl EP. Bleep. Despite an unexpected but completely understandable name change from Happy Meals, Scottish duo Free Love have never wavered from their taoistic path; acid utopianism by no other means than the universal language of dance music. Where for many the communal dream of rave died long ago, Free Love disrupt the monotony of today on Luxury Hits, making great tiger leaps from italo disco to synth pop and beyond. ‘Tomorrow Could Be Heaven’, they sing — and you’ll believe it.